Artist and maker John Jones created this coat in 1976. He titled it “Akhnaton” after the Egyptian Pharaoh Akhenaten, husband of Queen Nefertiti. Jones labelled it a ‘picture coat’ because of the life-like scenes it depicts. 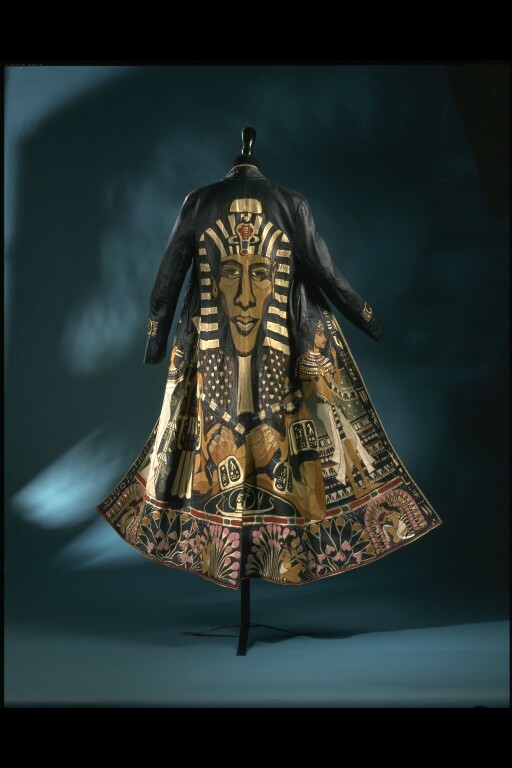 Featuring multi-coloured appliquéd pictures of ancient Egyptian life spread across the back and lower skirt of the coat, the design was inspired by the maker’s visit to the Tutankhamen exhibition held at the British Museum in 1972. 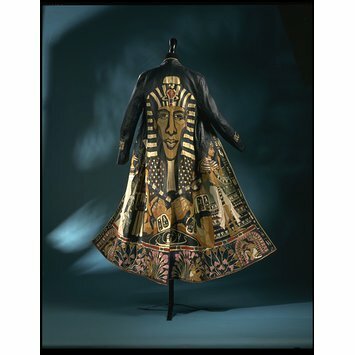 Fascinated by the secret languages and signs Jones wrote messages relating to current events onto the coat using his own system of hieroglyphic symbols. For example, on the coat’s front edges Jones referenced contemporary politics by writing in code, “ Hi, I'm Jimmy Carter and I'm running for president,” (Carter’s election campaign was in full swing at the time). The coat had an interesting life before it was acquired by the V&A. It was featured in the Observer Magazine in October 1976 and was subsequently hired by a touring Southend production of Joseph and the Amazing Technicolor Dreamcoat 1976. The V&A acquired the piece in 1989. 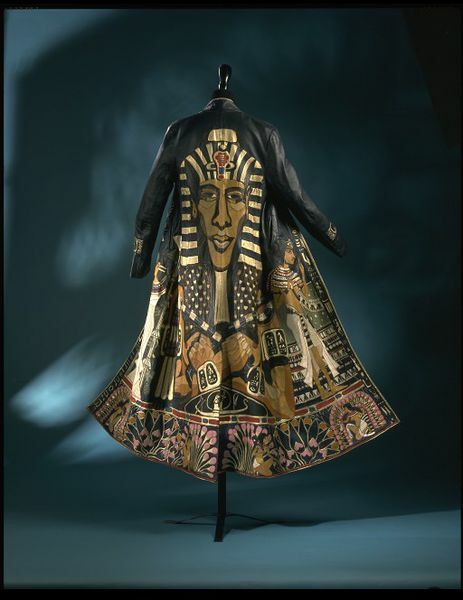 Black full-length leather coat with elaborate multi-coloured appliqué scenes of ancient Egyptian life spread across the back and the lower skirt of the coat. These scenes are made from thousands of stitched pieces of coloured leathers.